As a longtime fan of Windows Media Center, I was excited to see what new features the Windows 7 version would bring to the table. 1. Start Windows Media Center, then head to Tasks, Settings, TV, Guide, Edit Channels. 2. Scroll all the way to the bottom of the channel list (which may be quite long). The Internet TV channels start at 9000. 3. 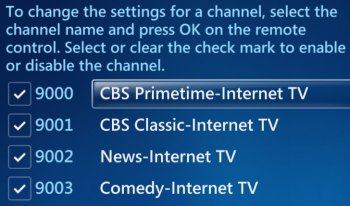 Clear the checkboxes next to any channels you want to remove from the guide. 4. Click Save, then head back to the guide to see the results.